Each year I get several questions about photographing fireworks around the 4th of July and again around New Year's. I always intend to post an article on shooting fireworks photos, but the holiday seems to conspire against me and I never get it done. This year, I've managed to pull it off. While I can't promise you'll be the Ansel Adams of fireworks after reading these tips, I'm confident you'll take better photos than you did last year. Use a Tripod If you get nothing else from this article, remember that it's almost impossible to do great fireworks photography without a tripod. One of the keys to photographing fireworks is the longer exposure time for your camera, which captures both the fireworks and any movements made by your camera as your shooting. A stable mounting makes all the difference and also allows you to adjust your camera at angles it might be unnatural to hold the camera. If you don't have a tripod, find an unmoving surface, like the roof of your car or a wall, but generally speaking even a cheap tripod will serve you better. Remote Shutter Release If your camera came with any kind of remote control, now is the time to learn how to use it. You want that camera to be unmoving as you are taking pictures of fireworks. When you use a tripod, the single most common cause of camera shake is pressing the button to snap a photo. The tradeoff here is you also need to be able to anticipate shots, which can be tricky in any circumstances. 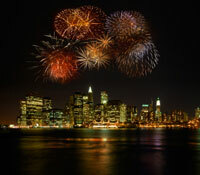 Start practicing with the remote prior to the fireworks display so you are prepared for great photographs. Framing Your Shot Geography will conspire against you in getting great photographs. If you know where the fireworks will be, scout your location ahead of time and get their early to stake your claim. Try to set up above the level of other bystander's heads so that you can capture fireworks without getting a Mystery Science Theater style silhouette in the front. 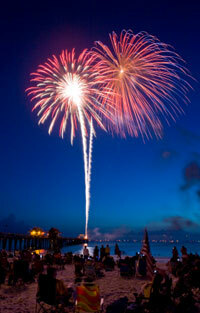 The biggest things to keep in mind while framing: Level your horizon line so that buildings and other background items appear naturally in the shot; Decide on vertical or horizontal framing ahead of time - vertical tends to be better for capturing the trajectory of fireworks, while horizontal is better for capturing fireworks in surrounding scenery. In picking a location, be sure to be upwind of the fireworks so that you don't have smoke blowing into your shots. Setting Focal Length Manual focus cameras work better for shooting fireworks, so if you have one use it. Setting your camera for wider shots and then cropping the image down to a tighter shot later is far easier than zooming in too tightly and missing the great shots as a result. Tight shots often have a visual appeal superior to those wider angles, but you can create that effect in your editing software far easier than you can capture it in the wild. Shutter Speed Settings Shutter speed is the secret sauce of getting a great looking fireworks photo. You want long exposure times designed to capture the entire bloom of a fireworks display. Look for the option in your camera to keep the shutter open for as long as you hold down the shutter button, then rely on the remote to take your picture and keep the shutter open. It's nearly impossible to hold your hand steady pressing on the button physically located on the camera for the entire length of a fireworks blooming process. Setting Aperture This is another one for manual mode cameras. If you can set your camera in the f/6 to f/8 range, you will shot great fireworks photos with a fair amount of reliability. I find aperture settings to be far less important than getting the shutter speed right. ISO Setting ISO is almost as important as shutter speed in getting a clean shot of fireworks displays. Higher ISO typically means more noise, so go for a lower setting around ISO 100 if you have the option to set it. This works best in combination with using a tripod, so be sure you're prepared to keep your camera stable.